"Smedvig's playing is absolutely spectacular, with hair-trigger control and high-wire acrobatics aplenty." Rolf Smedvig is one of the world's great trumpeters, a dazzling virtuoso acknowledged as a soloist and chamber musician of international renown. He has performed as soloist with many orchestras, among them the Boston Symphony Orchestra, the National Symphony, Cambridge Chamber Orchestra, the New World Symphony, and the NHK Orchestra of Japan, performing there under the direction of Seiji Ozawa. In 1995 Mr. Smedvig made his debut with the Chicago Symphony Orchestra at the Ravinia Festival. In 1997 he appeared on tour with the Atlantic Classical Orchestra and was a guest at the 41st Eastern Band Festival. He has been a frequent guest at festivals: at Tanglewood, Wolf Trap, Chautauqua, at the Bach Festival in Marlboro and the Casals Festival in Puerto Rico. As a founding member and first trumpet of the Empire Brass Quintet, Mr. Smedvig has toured 35 countries in North and South America, Japan, Russia, Europe and Great Britain. The quintet is not only an acclaimed chamber group; it also performs with orchestras like the Chicago Symphony, New York Philharmonic, Cincinnati Symphony, St. Louis Symphony, Minnesota Orchestra, Philadelphia Orchestra and the Boston Symphony. It is a frequent guest of nationally syndicated radio programs including St. Paul Sunday Morning and Traditions and has been televised on Good Morning America, the Today Show and Mr. Roger's Neighborhood. In 1996 at the Pacific Music Festival he was named International Principal with members of the Berlin and Wein Philharmonic. Mr. Smedvig's CD of virtuoso trumpet concertos with the Scottish Orchestra, the first of an exclusive contract with Telarc Records earned a grammy nomination . The following year he toured North America as soloist with that orchestra. Other Solo Recordings include Virtuoso Trumpet featuring the Bach Brandenburg Concerto #2 and the 2nd Orchestral Suite. With Organist Michael Murry he recorded the critically acclaimed Ceremonial Music for Trumpet and Organ all on the Telarc Label. In addition to recordings on the Sony/CBS Label , Angel EMI His recordings as first trumpet of the Empire Brass on Telarc include Royal Brass; Braggin' in Brass; The Empire Brass: Gershwin, Bernstein, Tilson Thomas; Music for Brass, Organ and Percussion; Class Brass; Romantic Brass; Class Brass: On The Edge; Empire Brass: On Broadway; Music of Gabrieli; Mozart For Brass; Passage; King's Court and Celtic Fair and The World Sings an Empire Brass Christmas. In 1996 the Boston Ballet presented the World premier of the Ballet "Passage" music written, arranged and adapted by Rolf Smedvig . The Telarc CD "Passage" was Co -Produced by Mr. Smedvig. Mr. Smedvig has served as Music Director of the Williamsport Symphony and has also conducted the Cambridge Chamber Orchestra. Other recent conducting engagements include the Honolulu Symphony, Northwest Chamber Orchestra, Tohnhalle Orchestra of Zurich, and the Simon Bolivar Orchestra of Caracas, Venezuela. With the Venezuelans he has appeared numerous times and on tour. Mr Smedvig was instumental in bringing the entire orchestra to Tanglewood for instruction with Seiji Ozawa. Rolf Smedvig also conducted a full length CBS television broadcast from Boston's Government Center. During the 95,96, and 1997 concert season Smedvig was a frequent guest of the New World Symphony Orchestra where he served as conductor and soloist. He was born in Seattle and made his debut as a soloist with the Seattle Symphony when he was 13. He studied at Boston University with such teachers as Armando Ghitalla, Raphael Mendez, and Maurice Andre. While studying at Tanglewood in 1971 he was invited by Leonard Bernstein to perform as soloist in the world premiere of the composer's Mass that marked the opening of the Kennedy Center in Washington, D.C. At the age of nineteen he was appointed Assistant Principal Trumpet of the Boston Symphony by Seiji Ozawa, becoming the youngest member of the orchestra. Having served the orchestra in performance and recordings for eight years, in 1979 he was appointed Principal Trumpet and held that position until 1981 when he left to pursue a career as soloist and chamber music player. 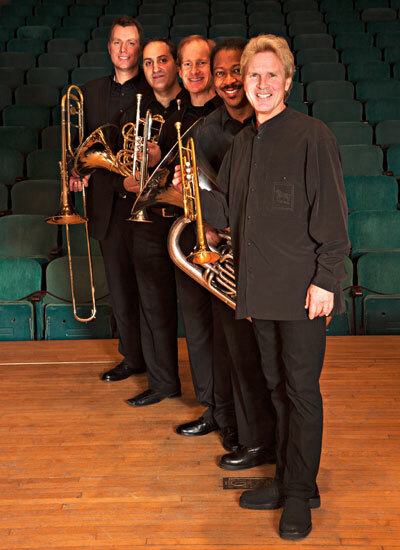 Mr. Smedvig has served on the faculty of Boston University and the Tanglewood Music Center and he founded the Empire Brass Seminar at Tanglewood. Currently he holds the International chair at the Royal Academy of Music in London, and is a clinician for the Selmer Company. He is an accomplished arranger/composer, with hundreds of works recorded and published by the G. Schirmer , KRS Publishing and the International Music Company. In 1996 he was featured in the Warner Brother's Video the 21st century Band Method. Michelle Perry began her musical studies on piano at the age of six, and presented her first solo recital at the age of seven. A native of Bartlesville, Oklahoma, Ms. Perry has traveled extensively, presenting hundreds of concerts across the United States, South-East Asia, Europe, South America, and the Far East. A Yamaha Young Performing Artist, she has been a guest artist at the Bands of America National Convention, sponsored by Yamaha Corporation, the 1998 and 2000 OK Mozart International Festivals, and has presented solo performance around the United States and abroad. Ms. Perry's orchestral engagements include performance with the Boston Symphony Orchestra, Boston Pops, Milwaukee Symphony, Honolulu Symphony, New World Symphony, the Malaysian Philharmornic, Oslo Radio Orchestra, Phoenix Symphony Orchestra, and in Carnegie Hall under the direction of Pierre Boulez. As a member of the Southwest Brass Quintet, she served as an artist-in-residence in several public schools, presenting many public concerts and educational outreach programs. Ms. Perry has appeared at numerous conventions and festivals, including Music Acacemy of the West, international and regional horn workshops, international brass festivals, Music Educator's National Conventions, Aspen Music Festival, and Tanglewood Music Festival, where she performed as solo horn in Mahler's Symphony No. 5 under the direction of James Conlon in Seiji Ozawa Hall. The winner of numerous solo competitions and awards, she has also been involved in several group commissions and world premieres of new works. A J. William Fulbright Scholar and alumnus of Arizona State University, her principal teachers include Froydis Ree Wekre, Thomas Bacon, and Bruce Heim. A winner in the Houston Symphony's prestigious 2000 Ima Hogg International Solo Competition, she was a member of the New World Symphony, playing Principal Horn under the direction of Michael Tilson-Thomas, and recently served as Principal Horn of the Malaysian Philharmonic in Kuala Lumpur, Malaysia. Ms. Perry currently freelance in the Boston area, with her most recent engagements including performance with the Boston Symphony Orchestra and the Boston Pops, and an appearance as a guest soloist at the 2002 Oklahoma Music Educator's Convention. Ms. Perry can be heard on Summit Records and RCA Victor. Kenneth Amis was born and raised in Bermuda. He began playing the piano at a young age and upon entering high school took up the tuba and developed an interest in performing and writing music. A Suite for Bass Tuba, composed when he was only fifteen, marked his first published work. A year later, at age sixteen, he enrolled in Boston University where he majored in composition. After graduating from Boston University he attended the New England Conservatory where he earned a Master's degree in composition. Mr. Amis has been commissioned to write for the annual Cohen Wing opening at Symphony Hall in Boston, The Massachusetts Instrumental Conductors Association, the Belmont High School Band, Gardener High School Band, the New England Conservatory Wind Ensemble and the College Band Directors National Association. As a tuba player Mr. Amis has performed as a soloist with the English Chamber Orchestra and has been a member of the Tanglewood Festival Orchestra and the New World Symphony Orchestra. He has served on the faculties of Lynn University, Boston University, Boston University Tanglewood Institute and the Pacific Music Festival in Japan. Mr. Amis is presently the tuba player of the Empire Brass, a Performing Artist for Besson tubas, a composer for Boosey & Hawkes Publishing and holds the International Brass Chair at the Royal Academy of Music in London. Douglas Major, Organ, an internationally recognized solo artist, has toured throughout the United States, Europe and the Far East. In addition to his career as a recitalist, Dr. Major is the organist of the Washington National Cathedral, where he has been on the staff since 1974. From 1988 through the spring of 2001 he was organist and choirmaster of the Cathedral. His new position as cathedral organist will allow for composition, recital performance and assisting with the outreach programs of the cathedral. Dr. Major plays many solo recitals and dedications of new organs in the United States each season, as well as concerts with the Empire Brass Quintet. In the past few seasons, he has appeared in Sacramento, Houston, Portland, Vero Beach, Atlanta and Grand Rapids. He has toured as organ soloist with the Orchestre National de France and Lorin Maazel and also has toured in Japan with the Empire Brass Quintet. He collaborated with Barry Tuckwell and the Maryland Sumphony for a series of concerts to mark the opening of the rebuilt organ at the Maryland Theatre in Hagerstown and played a solo concert tour to Taiwan and the Philippines. In May of 2001 he participated in the first American Organists' Festival in Kiev, Ukraine, playing recitals to standing-room-only audiences. Dr. Major's solo recordings include eight organ compact discs recorded on the Washington National Cathedral's magnificent 185-rank Skinner organ. With the Empire Brass of Boston, Major has recorded "A Bach Festival" for Angel/EMI. He has just completed a new recording for music by Widor and Franck, demonstrating the incredible versatility of the cathedral's Great Organ. Steve Wilkes is the drummer for the Boston production of the Blue Man Group's acclaimed show "Tubes", and a Percussion Department Professor at Boston's Berklee College of Music, where he teaches drums, electronic percussion and world music rhythms. He is co-author of the book The Art of Digital Drumming, a Hal Leonard publication, and a writer for both Electronic Musician and Percussion Source magazines. His love of electronic music and world music have dovetailed nicely to find the perfect vehicle in World Trax, a new software package of programmed drum grooves for DRUMTRAX, the company which produces drum pattern libraries for MIDI sequencers and computers. Steve is also an endorser and clinician for Pearl Drums and Zildjian Cymbals. He and fellow Pearl clinicians Casey Scheuerell and Maria Martinez have produced a series of drum awareness clinics for Pearl's pilot educational series, Hooked on Drums. These clinics bring music technology and multi-culturalism to public schools in the form of a drum clinic. In 1994 Steve was the recipient of the Uchida Fellowship Grant of the Japan Foundation. This grant allowed him to travel to Japan and Indonesia to study Japanese taiko drumming and Balinese gamelan. Steve is co-leader (with vocalist Ginny Fordham) of the band, Fordham Wilkes, whose most recent CD From the Earth Below, is available on Popular Records, his solo CD. The Secrets of Shadows, is a fusion of Japanese traditional music and modern western pop music. He has also composed music for Aircraft Production Libraries based on Native American rhythms. In the spring of 1997 the self titled debut CD by Steve Wilkes and Six Drumsets was released. This CD, featuring compositions by Steve for six drum kits, is a first in the world of percussion as it presents the indigenous drum of the modern world (the drumset) in a never before heard "orchestral" context. Steve has also performed with percussion great Glen Velez, David Bowie, keyboardist Mike Garson, rock legend Leslie West, and Spyro Gyra marimbist, Dave Samuels. During the 1997-98 season Steve Wilkes will appear on tour and on the Telarc CD, Celtic Butterfly, with the Empire Brass.